The Jews knew about “bread from heaven,” the manna God had fed their ancestors during the forty years they wandered in the desert. So, when Jesus said “I am the bread that came down from heaven” they thought he was nuts. Certainly, they didn’t want what he was offering which accounts for the tension in the story. Instead of getting Jesus to agree to give them what they wanted such as food to fill their bellies, the Lord insisted that they believe in him. He insisted that they change their thinking about him which is the work God wanted of them and the work God also wants of us. To understanding Israel’s refusal of Jesus and of God’s will we look to the readings. In the first reading, like wining children who couldn’t get what they wanted they were discontented. Why? Their hearts were not set on God or Gods law but on satisfying their base desires. St Paul sums up this rebellion against God and doing God’s will in the two missing versus in today’s 2nd reading. ‘We have become alienated from God because we have given ourselves up to sensuality and our hearts have become callous.’ It is the same today – we choose pleasure and instant gratification instead of God. And to quash our conscience we close our mind and our heart to God. Just as his diagnosis, St Paul’s remedy is equally valid today: (i) we should put away the old self of our former way of life corrupted through our following our sensual desires and (ii) our minds must be spiritually renewed so we can put on a new self created in Gods way, in goodness and holiness of the truth. In fact St Paul is teaching the way of faith later more perfectly described by Saints such as John of the Cross. We have been corrupted by our seeking things seen to the eye and experienced through our senses. But God transcends the material world so our mind must be retrained to seek spiritual goods and our heart must be retrained to cling to what we ‘see’ after our mind has been renewed. So, what is the message for us? Our work in believing in Christ is twofold. We must continue to divest ourselves of our old self with its associated illusory desires. Second, we are to open our mind to the Spirit, and to a total transformation in the way we think. Conversion through negation of our disordered desires and mental illumination through the practice of prayer. 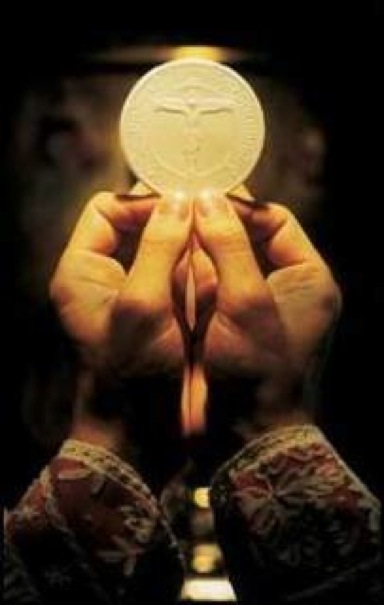 This will help us to hone our desires and hunger for Jesus hidden in the Eucharist, the true bread from heaven and food for our souls. Please God, amen.